Challenging conventional wisdom on grief, a pioneering therapist offers a new resource dealing with intense loss. Finally ... a book about grief for EVERYONE Review by Michelle L.
I've been gifted, loaned and purchased many grief books in the two years since my son died. 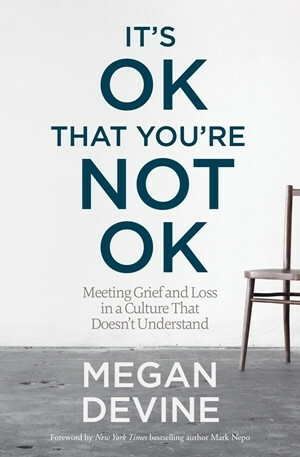 I can honestly say that none of those texts resonated with me and the truth of my grief experience more than Megan Devine's new book. She is a credible source of useful information, bringing not only her educational and occupational background to bear but more importantly her own life experience with deep loss and a broken culture. Above all, she is a truth teller and an advocate you'll want in your grief space. The beauty of this book is the universal insights it offers for EVERYONE who has experienced deep grief or desires to genuinely support another in their loss. The author outlines a refreshing take on grief for the reader's consideration, one where acknowledgment and a desire to love better are critical components in supporting ourselves and each other following a significant loss (ie. death, accident, illness, etc.) She adeptly explains the model's concepts in lay terms, provides numerous examples for better understanding, and recommends practical exercises that one can use to help identify and manage the impact of grief. The quotes from her writing students are especially relevant and poignant. I found Megan's work validating and thought-provoking, especially concepts such as her broader definition of "early grief", common platitudes (and why I feel their adverse affect), the critical distinction between pain and suffering (and how to minimize latter), grief as an experiment rather than a problem to be solved, and the vital role of acknowledgment and companionship in creating a way forward. One of my favorite sections is the appendix, an essay on helping a grieving friend, which offers carefully-crafted and readily shareable ground rules for supporting a loved one. This book is written by someone who "gets it". Someone who has been there and has been through a devastating loss of a loved one. She speaks with a raw honesty about how our culture is not prepared for the grief that comes with loss. It is well written, easy to read, and has helped educate me, in my shattered grief, that my grief belongs to me; that I am not crazy and I'm doing grief the only way I know how; that there's no time limit on grief and everyone deals with grief in their own way. And it's okay to cry. It's okay to feel distant from the rest of the world. It's okay NOT to be okay in grief.